The percentage of organizations that are interested in leveraging software-defined storage (SDS) as a long-term storage strategy. OSNEXUS QuantaStor is an SDS solution that allows organizations to turn commodity hardware into a globally scalable, software-defined storage solution with block, file, and object protocol access. OSNEXUS leverages the scale-out capabilities of proven open source solutions from Ceph, GlusterFS, and ZFS in conjunction with its own proprietary storage hardware virtualization capabilities. This enables OSNEXUS to offer organizations storage deployment flexibility from the open source technologies, while also removing many of the complexities related to configuration, management, and growth. And because QuantaStor supports simultaneous deployments of high-performance file, block, and object storage via Ceph, GlusterFS, and ZFS, organizations gain agility to dynamically allocate storage resources to applications with different storage requirements whenever they are needed. 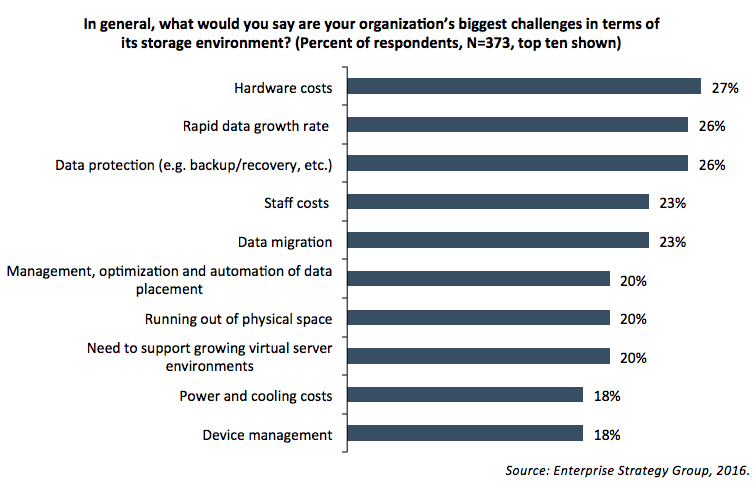 ESG recently conducted a survey of 373 IT professionals and respondents were asked to identify what they would consider to be their biggest challenges with respect to their storage environment. 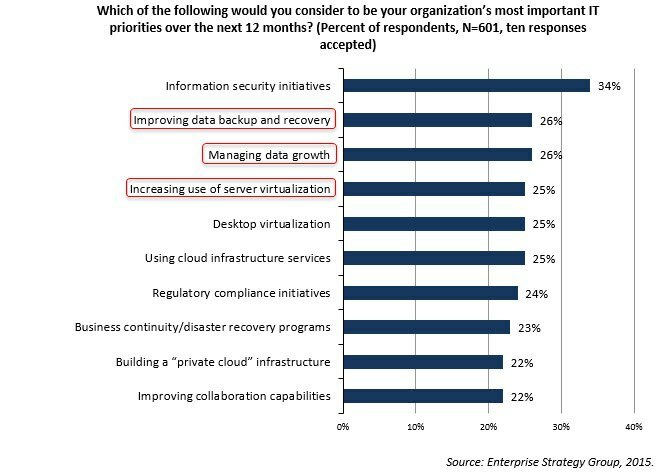 As one might expect from a captive audience of server virtualization users, there was significant focus on data growth (cited by 26% of respondents), data protection (26%), staff costs (23%), and data migration (23%). Perhaps of greatest interest and significance, however, is that hardware costs (27%) was the most-cited storage challenge, as seen in Figure 1. Organizations today must get used to the fact that most of their information—from e-mail, financial records, and employee data to sales orders, video surveillance files, and shipping/tracking details—has gone digital. This is not only true for back-end processes; on the front-end, databases are used to drive web-based operations while file sharing and collaboration are improving productivity, and mobile apps are enabling businesses to easily connect with customers and stay competitive. 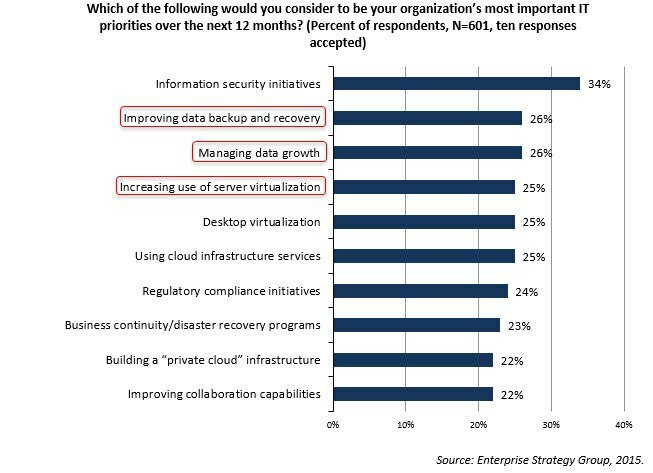 In spite of the fact that backup and recovery are longstanding IT disciplines, they remain challenging and problematic to the point that only 3% of organizations surveyed by ESG reported experiencing no challenges of any kind.